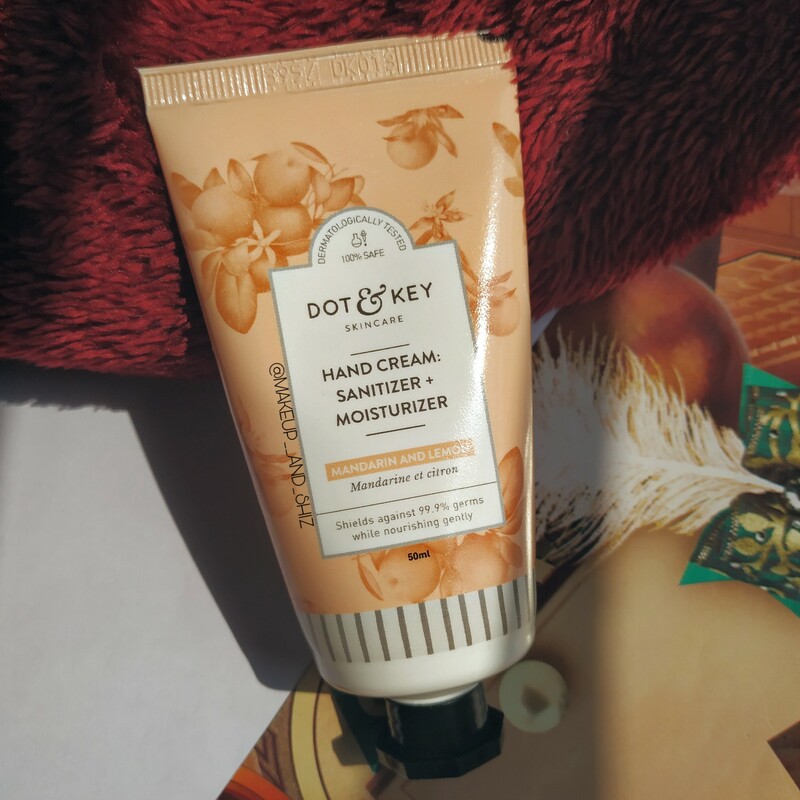 Dot and Key Hand Cream Sanitizer+ Moisturizer – Mandarin & Lime — Review. Bursting with citrusy freshness, this alcohol free hand cream and sanitizer contains nourishing actives that hydrate gently while its antibacterials shield you from 99.9% germs. It comes in a cute outer covering which looks very luxurious. It comes in normal tube like packaging with cork crew cap. It looks and feels very luxurious and cute. It’s travel friendly and doesn’t cause any kind of leakage . Squeeze out an adequate amount of hand cream on your palms and massage till it is completely absorbed. Well, it has been a week now since I am using it and I am so used to it. It looks white in colour. Not very creamy , neither liquid: the perfect balance in between. The texture is more like a very thick serum like. When you start rubbing on to your palms it feels very thin and light weight, which is a good feeling. One other best thing about this Dot and Key product is, using random moisturizer on hand works too, but as a student when I hold a pen to write or even use my phone it usually slips from my hand. With this hand cream , I am a happy person! And the smells lingers for about 30 mins. Also Read :Plum Goodness E-luminence Deep Moisturizing Creme – Review. Extremely dry hands might feel this to be less moisturizing. That was all for this post! Have you tried Dot and Key products? Previous Fabeya Shea Butter Body Scrub and Polish- Review. Next Dot and Key Underarm Colour Correction Serum– Review.